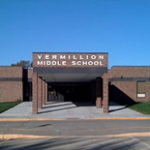 The Vermillion School District will build relationships that empower students to learn and optimize their potential. 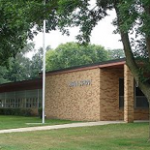 Serving the Clay and Union County communities of Vermillion, Burbank, and Meckling, the Vermillion Public School District encompasses 200 square miles located near Interstate 29 in southeastern South Dakota. The University of South Dakota is located in the city of Vermillion and offers many excellent opportunities for the students and staff. 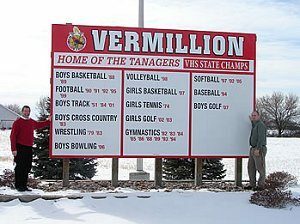 The Vermillion School District is governed by a five member school board, and is guided by a district superintendent and four building principals.The district operates one high school (Vermillion High School), one middle school (Vermillion Middle School), and two elementary schools (Jolley and Austin Elementary Schools). Current enrollment is 1200. 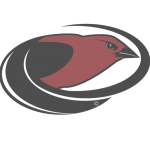 The Vermillion School District believes that quality education begins with classroom leadership. Because of that belief, the district provides research-based trainings and monitors student progress. Vermillion Schools provide professional development for teachers to keep abreast of the most current and best practices in education. The district provides five in-service days, and encourages teachers to pursue opportunities that deepen content knowledge and strengthen classroom practices. 98% of Vermillion educators are rated as highly qualified. Average years of experience among Vermillion teacher is 16 years. 20% of Vermillion teachers hold advanced degrees. 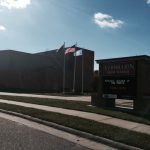 The Vermillion School District has an 89% graduation rate average over all socio-economic groups. The average composite ACT score for those high school students taking the test (83% of seniors) was 22.9. Vermillion students exceeded the state average in all areas of the ACT test. Vermillion students consistently score better than the state average in Dakota State Test of Educational Progress (STEP). 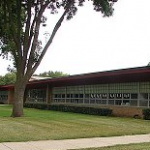 Vermillion Schools strive for a quality educational experience for students. A student information database can be accessed by staff, parents, and students. Teachers are encouraged to integrate technology into the curriculum.